This most interesting surname derives from either of two possible origins. Firstly, it may be of Anglo-Saxon origin, from the Olde English pre 7th Century personal name "Hereweald" or its cognate form the Old Norse "Haraldr", or the Continental form "Herold", introduced to Britain by the Normans. These all go back to an Old Germanic personal name composed of the elements "heri, hari", army and "wald", rule, which is recorded in Europe from an early date; the Roman historian Tacitus records a certain "Cariovalda", chief of the Germanic tribe of the Batavi, as early as the 1st Century A.D. 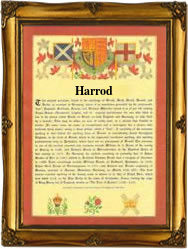 However, the surname Harrod may also be of Old French origin, as an occupational name for a herald, deriving from the Old French "herault", Middle English "herauld", a herald. The surnames, Harold, Haroll, Harald, Harrold, Harral as well as Harrall, Harrell, and Harrad also derive from the same sources. The personal names "Haraldus, Harold" were recorded in the Domesday Book, of 1086. Radulfus Haroud was mentioned in 1196 in the Feet of Fines of Yorkshire, and the Subsidy Rolls of Sussex record one Philip Harald in 1327. William Harrod (deceased 1819) compiled histories of Stamford (1785), Mansfield (1786, 1801) and Market Harborough (1808). The first recorded spelling of the family name is shown to be that of Ralph Harrold, which was dated 1171, in the "Pipe Rolls of Yorkshire", during the reign of King Henry 11, known as "The Builder of Churches", 1154 - 1189. Surnames became necessary when governments introduced personal taxation. In England this was known as Poll Tax. Throughout the centuries, surnames in every country have continued to "develop" often leading to astonishing variants of the original spelling.